(2010 Wolf-Friends Fic Contest) Autumnleaf follows a grieving Fadestar and makes a remarkable proposition. The dark shadows and the soft rain went unnoticed by the petite elf running swiftly through the woods, though they mirrored her mood. Soft quick paces and accelerating breaths were barely audible as the cub demanded more of her body than ever before. Fadestar ran as if her life depended on it. Her legs soured with every step, her chest felt if it could explode any time soon, and her vision was blurry with tears she didn�t want to shed just yet. The forest flashed alongside of her, the drizzle soaked her, but she didn�t see or feel any of it as she kept on pushing forward. Then, when her legs couldn�t carry her any more and she couldn�t go any further, she dropped on her knees and planted her hands in the ground. She moaned, a sob escaped her throat, and she felt tears pushing. Questions had started to run through her mind after the initial phase of denial and shock. How? Why? What for? Why her? Nobody could answer her questions. High Ones, it had happened inside the Holt, and so fast that Willow couldn't have done anything even if she had been there. The Holt was supposed to be safe! Angry, Fadestar hit the muddy ground a couple of times with her fists, before she rolled over on her back to regain her breath. Everyone was sad. Poor Windburn, losing his lifemate like that, poor Snowfall and Nightstorm for losing their sister, poor Cinder, who had to grow up without his mother -- and she knew what that was like. WhywhyWHY? It wasn�t fair! None of it made any sense! Fadestar pushed herself up, ready to run another distance, but her legs didn�t cooperate and she sunk on her knees again. She was completely exhausted and a meaningful distance away from the Dentrees, as well, which she only now noticed. She fell back, violently rubbing her tears away while she tried to regain her breath, and she listened to the forest sounds while she tried to order her thoughts. She didn�t mind the quiet. Since her mentor had died, Fadestar had tried to find peace with what had happened on her own. She didn�t want to talk about it yet with her family or friends, while the wounds were still so fresh; she felt like she couldn�t. Instead, she wanted to figure it out by herself even though the tension within her started to build up so high that she couldn�t think clearly anymore. Today, she had been so angry with Whispersilk for being so careless, for causing so much pain, that she had wanted to run it off. And finally, the weather had thawed enough for her to do so, the ice was all melted and it felt more like spring again than it had during that terrible storm. Running had helped, until the moment she had collapsed. However, she had never gone this far away on her own before. She couldn�t withhold the tears and a sob escaped her throat. She was so mad at Whispersilk, not only because she had left her family, but also because she left Fadestar. After the cub had woken up, she had gone back to Whispersilk � less frequently than before, because she had also wanted to play with her new friends and because she had started to learn how to use a few weapons, as well. She now felt guilty for not going more often, even though she had learned so much over the last few moons. And now, Whispersilk was gone and Fadestar hadn�t found the courage yet to enter the weaver�s den without her, knowing that Whispersilk�s scent would still linger there. �Curse you, Whispersilk, for leaving us,� she whispered, and even her whisper sounded loud before it echoed away in her mind. Then � a sound, nearby. Slightly alarmed, Fadestar jumped up, her feet still hurting. Two light yellow eyes stared at her, and her shoulders relaxed. A wolf, from the pack. Autumnleaf, she remembered, the pretty loner wolf that wouldn�t let anyone ride her. Fadestar had seen her around before. �Go away,� Fadestar said, not in the mood for company. She wanted to sit alone for a while, before returning to the Holt. She didn�t want to go back yet, because Snowfall was so sad. Snowfall managed to hide it well, but Fadestar sensed the grief in the den they all shared. Everyone was sad, not only Whispersilk�s family, but everyone in the Holt. The wolf didn�t blink, and took a few steps forward. She sent an image of Fadestar sitting by herself, **alone. ** Fadestar didn't understand what the wolf was trying to tell her because her mind was focused on her grief. Now she thought of it, the day before, Autumnleaf had also been close-by when Fadestar had sought refuge near the river. Only then, she had remained at a distance. Fadestar didn�t know why the wolf now approached her, or maybe she didn�t want to understand because she wanted to be left alone. The wolf seemed to hesitate after such a blunt refusal and stared into Fadestar�s grey eyes. **Alone together,** was the image the wolf sent. It almost seemed like a question, but Fadestar averted her eyes. �Go away,� she repeated, softer this time. Autumnleaf observed the young cub, before turning around. The wolf's next send, an image of the child alone in the forest, accompanied by the sentiment, **danger,** caused Fadestar to look up, alarmed. Was she in danger? She knew it was dangerous to be alone outside of the Holt and she hadn�t really been paying attention on the surroundings, struck with grief as she was. She rubbed her eyes and looked around, while Autumnleaf sat down at a little distance away. Eventually, the wolf lay down, placing her head on her front paws without taking her eyes off the cub. Fadestar frowned, and diverted her anger from Whispersilk to Autumnleaf. **I don�t want you here,** she sent angrily; however, the wolf only twitched an ear and didn�t move otherwise. Frustrated, Fadestar balled her fists and punched the ground until her hand hurt. Why didn�t the wolf listen? She wanted to be alone. However, the wolf repeated her latest send to the cub and added a strong feeling of herself protecting the elf. **I don�t need your protection,** Fadestar sent back, before rubbing her tears away with her sleeve, but they seemed too stubborn to go away, just like the animal observing her. **Stubborn. ** That feeling came through clearly, and was that also amusement in Autumnleaf's send? Fadestar shot an angry glance into her direction, but the wolf didn�t move an inch. Then, slowly, Autumnleaf lifted her head and carefully got up her feet. She came a little closer but stopped when Fadestar lifted her hands. **What do you want from me? ** Fadestar sent, her anxiety visible in her send. The she-wolf observed the cub, and it made Fadestar feel a little uncomfortable, however, she did not look away. Part of her didn�t want to look away. The bright eyes of the wolf seemed to look right through her. Still, she felt her anger and grief fade just a little because of Autumnleaf�s presence. **Running together,** were the images that Autumnleaf then sent to her, but again, it felt like a question. Fadestar�s mouth fell open and for a moment, she was speechless. **You? ** she finally sent. The disbelief was clear. **But you�re�** Old, she had wanted to send but she bit it back. 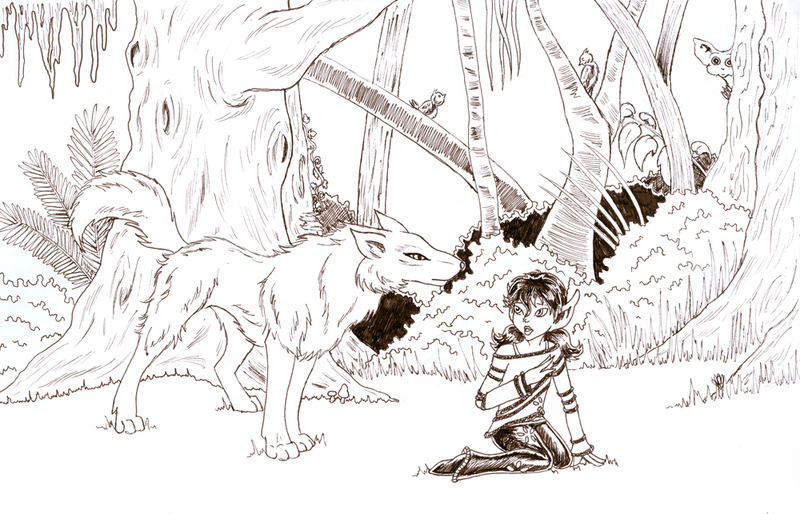 She had never considered one of the older wolves as her friend, despite the fact that Newt had bonded to Browncoat. She had dreamed about bonding to a little wolf cub and growing up together, but had never expected this! Autumnleaf's ears perked up, and she sent back clear images of herself as strong and fast, helping Fadestar to learn the way the older wolf would have helped the wolf-cubs. Fadestar turned her eyes away from Autumnleaf�s piercing gaze. Autumnleaf's suggestion of teaching had made her mind return to the reason why she had come out here in the first place. **I don�t want another teacher,** she softly replied, her grey eyes filling up with tears again. **My teacher is dead. ** Leaning on one hand, she used the other hand to cover her eyes, and her breath was shaky as she tried to take a deep breath. Then, she felt a movement close-by and when she looked up, Autumnleaf was so near that Fadestar could easily touch her. With a soft whine, Autumnleaf lay down and curled her body around Fadestar�s before raising her head, carefully licking Fadestar�s face, removing the tears from her cheeks. The tender gesture broke Fadestar�s heart. Breaking down in sobs and long wails, she hid her face in Autumnleaf�s reddish fur, her fingers disappearing in the thick fur coat. The she-wolf watched the cub cry, and waited patiently. **We should go back,** Fadestar softly sent, safely curled up against the wolf�s belly. It seemed so much later than when she had come out here, but her body told her it hadn�t been that long ago. She ached all over and her feet were still sensitive. She felt exhausted, not only from the running but also because she had cried all her tears out and she now had the feeling she was completely empty. Autumnleaf affirmed her send, carefully shifting her weight. The wolf tilted her head before she replied with the same set of strong images she had first sent, **alone together. ** If Autumnleaf could have shrugged, Fadestar suspected, she would have. The she-wolf added a more complex set of feelings and pictures, of the wolf and the young elf helping each other. Fadestar knew Autumnleaf could help. Though she wasn�t skinny anymore and had regained strength, she needed to work on her endurance and her hunting skills. Autumnleaf was experienced, so Fadestar could definitely see it working. She wasn�t sure what she could do for the wolf, but perhaps she would find out later � it didn�t seem to matter at this moment. She hesitated for another heartbeat, but then she embraced the wolf. **Thank you,** she softly sent. It was not just for the bond, but also because Autumnleaf made her realize that she should not only return to the Holt physically, but also mentally. She had pulled back, had become distant even towards her friends, but the wolf had made it clear in a way that she could not isolate herself. She belonged in a tribe, and now she should go back. Autumnleaf glared back, and half amused, she sent back in images, **cub leaning for support. ** It was an offer Fadestar gladly accepted, both physically and mentally. The process of healing would be long and difficult, but her new friend had made her take that first important step of reconnection.